In 2017, Dr. Roderick Jackson (BSME '00, MSME '04, Ph.D. '09) from Oak Ridge National Laboratory (ORNL), was awarded with an Innovator of the Year award at the Young, Gifted & Empowered Awards for his groundbreaking work in building energy efficiency innovation. As the lead at ORNL’s Building Envelope Systems Research Group, Dr. Jackson leads the Building Technologies Office’s (BTO’s) partnership with ORNL on their building envelope projects, working with both BTO’s Emerging Technologies and Residential Buildings Integration programs. Dr. Jackson also serves as the technical lead for the Additive Manufacturing Integrated Energy (AMIE) demonstration project. In its third year, the YG&E recognizes exceptional young African-American professionals from Mississippi who are champions in the arts, business, philanthropy, education, innovation, and leadership. The honorees are between the ages of 25-45 and have demonstrated a noteworthy commitment to excellence and community service and a high level of character, leadership, and innovation. 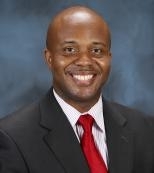 Dr. Jackson earned his undergraduate degree in mechanical engineering from the Georgia Institute of Technology, returning to Mississippi to start his own construction company with his father in 2003. He completed his master’s degree in mechanical engineering while running the business, but decided to leave the company in 2005 to pursue his doctorate degree in mechanical engineering. He joined the team at ORNL in 2009, where he began doing research and development in the Buildings Technology Research and Integration Center. Through his work at ORNL with BTO, Dr. Jackson is pioneering research, development and demonstration in the building envelope and with the AMIE demonstration project. BTO’s building envelope R&D subprogram seeks to develop next-generation residential and commercial building envelope technologies that reduce the energy required to heat and cool a building and have a market-acceptable installed cost. BTO is working with both industry and lab partners to advance such energy efficient solutions to the commercial market. ORNL, under Dr. Jackson’s leadership, has been a key component of BTO’s envelope portfolio and success. Dr. Jackson’s envelope work with BTO includes performance evaluations and field tests, energy modeling, and technology development. In one project specifically, Dr. Jackson and his team are developing modified atmosphere insulation panels, a new-generation vacuum insulation panel that has the same thermal performance as traditional vacuum insulation panels, but can be produced at approximately 50% of the cost and is six to seven times more insulating than current, commercially available insulation materials. AMIE, the Additive Manufacturing Integrated Energy project, is one of the world’s first 3D printed homes. Not only is it a 3D printed house, AMIE is also a vehicle, solar panels, energy storage, and intelligent controls, all wrapped up in an integrated system. The Energy Department’s Building Technologies Office, Advanced Manufacturing Office and Vehicle Technologies Office worked together with ORNL and a multitude of industry leaders to design and construct this innovative structure in less than one year. Both the vehicle and home were printed with ORNL’s Big Area Additive Manufacturing Machine (BAAM), one of the world’s largest and most productive 3D printers, which greatly reduced costs and time of production. AMIE demonstrates the possibility of integrating the home, vehicle and the grid in a cohesive system, using smart controls to match its internal loads with solar generation and wireless two-way vehicle power/charging. AMIE shows us that we can dramatically improve the efficiency and resiliency of the nation’s housing stock, vehicle fleet, and grid—all at the same time.